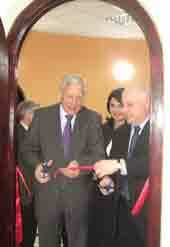 On December 16th in Tbilisi Youth Reproductive Health Medical-Information Center was opened at the National Family Medicine Training Center (NFMTC) in the frame of the project “Reproductive Heath Initiative for Youth in the South Caucasus (RHIYC), supported by the European Union (EU) and United Nations Population Fund (UNFPA). Newly opened center, one of the 16 similar centers to be opened throughout Georgia shortly, will provide youth below age 25 years with youth friendly reproductive health information and services: counseling, testing and RH commodities. Special attention and information materials for youth are dedicated to healthy life style. Referring to the statistical data, more than 50% of births in Georgia are given by women of age below 25, the average marriage age in Georgia is much lower than in European countries. Taking into account that youth has limited knowledge on RH issues, and growing numbers of STIs/HIV/AIDS, the need for such services is evident. In addition to RH services, young people can receive wide range of medical services offered by NFMTC and available at the same building. Major part of medical assistance will be covered by the customers or the insurances companies. Such convenient neighborhood is additional benefit for young people. As the head of the UNFPA Georgia office Tamar Khomasuridze explained “Opening of such centers would never happen without financial support of EU. UNFPA is proud to co-fund and implement such an important initiative, which covers three Caucasus Countries: Armenia, Azerbaijan and Georgia. Opening of Youth Friendly RH services is only one component of the project - the RH Service centers are linked with Youth Friendly Information Centers, already operational at three Universities in Tbilisi, Gori and Batumi. Other components of the project are focused on awareness raising, partnership building and high level policy dialogue for youth RH”. The Head of EC Delegation in Georgia Mr. Per Eklund underlined the importance of regional approach to youth RH. “Similar projects work well in Azerbaijan and Armenia as well. I think it is an important facility for the young people to come here and ask the questions about the issues they are interested in”, he said. The project is supported by Georgian Government and NGOs. The opening ceremony was attended by the MPs, vice speaker of Parliament of Georgia, George Tsereteli and head of Parliamentary Committee of Health Care and Social Issues Otar Toidze. George Tsereteli mentioned that this project is one of the priorities for the government as the matter is about the future generation - “The young people need more health information because there are many new methodologies and achievements that should be spread more actively. Healthy life style and good reproductive health is in some way a precondition for the creating healthy family. Such center provides young generation with the information that will help them to be healthy and make them ready for the parenthood. I am glad that Georgia is leading this regional initiative”. Before official opening of new Medical-information Center, RHIYC project (www.foryouth.ge) awarded four journalists – the winners of the contest, organized in 2008 for the best highlighting of the youth reproductive health issues.